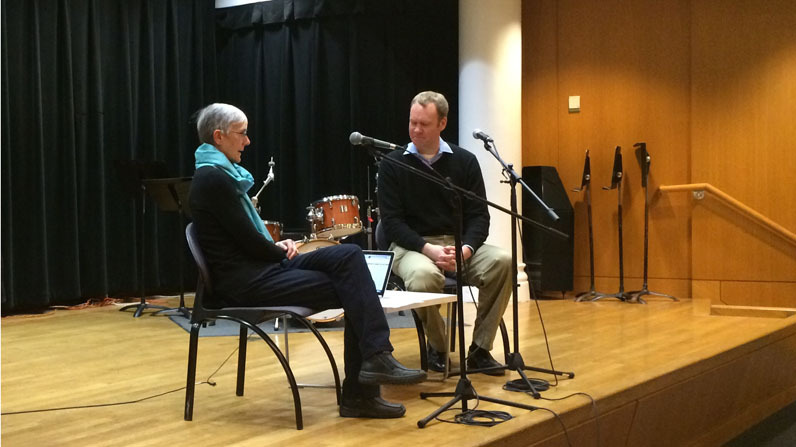 New York University Professor of Music Suzanne G. Cusick and Make Music New York President Aaron Friedman talked during the recent Make Music Monthly event. Photo by Clara Schumacher. Terror suspects held at U.S. military– and CIA-run prisons from 2001 to 2006 experienced just that. As Cusick explained, many detainees were subjected to a near-continuous barrage of sound and music—valued tools in an arsenal of “enhanced interrogation techniques” used in the War on Terror. “There was a set of techniques—sleep deprivation, extremes of heat and cold, strobe lights, stress positions, waterboarding, gender humiliation, and, yes, loud music—that were used to break down a prisoner’s ability to resist interrogation,” Cusick, a professor of music, added. Cusick made her remarks during the latest edition of Make Music Monthly, a podcast series featuring musicians and musicologists in discussions of all things aural. Hosted by Make Music New York (MMNY) and The New School for Jazz and Contemporary Music, the conversations are recorded in front of a live audience at the Jazz Performance Space at The New School’s Arnhold Hall. Speaking with MMNY president Aaron Friedman, Cusick detailed the disturbing history behind the torture techniques employed in the War on Terror, beginning with the sensory deprivation studies conducted by Donald O. Hebb at McGill University in the 1950s. The U.S. military and the CIA drew on Hebb’s studies in devising the torture techniques used on detainees at Guantanamo Bay, Abu Ghraib, and other prisons around the world from 2001 to 2006. “I found this shocking and surprising because I’ve always found music pleasurable, not a means of torture,” she said. Make Music Monthly picks up on Wednesday, February 18, with composer, musicologist and record producer Ned Sublette in a discussion about Cuba, its music, and the future of its artists in light of the recent normalization of diplomatic relations with the United States. The series continues with Andrew Cyrille on Wednesday, March 18; Charlie Morrow, David Rothenberg, and David Soldier on Wednesday, April 15; and Anastasia Tsioulcas on Wednesday, May 27. For more information, visit makemusicny.org/make-music-monthly.